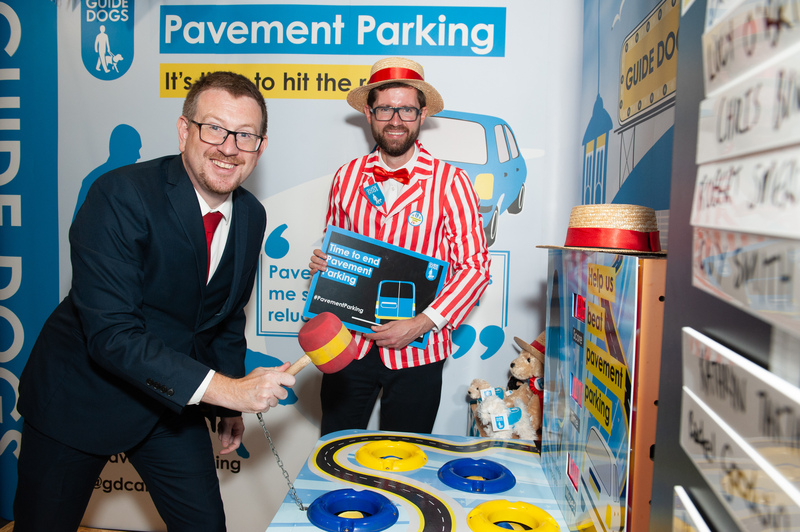 Denton and Reddish MP, Andrew Gwynne, helped raise awareness of the dangers of pavement parking at Guide Dogs’ (un)fairground during Labour’s Party Conference. Gwynne spoke with the charity Guide Dogs at the Labour Party conference about the challenges pavement parked cars create for blind and partially sighted people, who may have to risk their safety by walking into the road just to get by. The MP for Denton and Reddish heard of the difficulties that councils face in trying to tackle the issue with their current powers, and why Guide Dogs is calling for a clear law on pavement parking. To illustrate the problem, the charity asked Andrew to clear the streets of pavement parked cars against the clock on a specially-themed whack-a-mole game. Andrew Gwynne MP is supporting Guide Dogs’ campaign to make pavement parking an offence, except in areas where local authorities grant specific exemptions. This would give local authorities real power to properly tackle this problem and bring the rest of the country in line with the current law in Greater London, which has been in place since 1974. “A few months ago I supported the the findings of Guide Dog’s report, Streets Ahead, which found that 88% of all respondents agreed that street clutter caused problems for them when they are out and about. This figure rose to 97% among blind and partially sighted respondents.